A hearing aid is a valuable investment that can improve one’s life in countless ways. These six do’s and don’ts will help you to wear your hearing aid safely and comfortably, and show you how to prevent damage to this crucial instrument. 1) DO: Keep them away from moisture. As with many electronics, moisture is one of the most potentially damaging things to hearing aids. Do your best to keep your devices from coming into contact with water, and always make sure to remove your hearing aids before showering, swimming, going out into the rain, washing your face, or any other scenario where you are likely to become wet. Humidity can also be harmful to hearing aids, so consider buying a dehumidifying unit to store your devices in at night–especially if you live in (or are travelling to) a place with a humid climate. 2) DO: Check them every morning. Before starting your day, take a moment to make sure that your hearing aids are functioning properly. Some devices will play a melody when they are turned on, and others will turn on without making sound. To quickly check amplification levels, rub your hands next to your ears after inserting your aids–you should be able to hear the sound clearly. 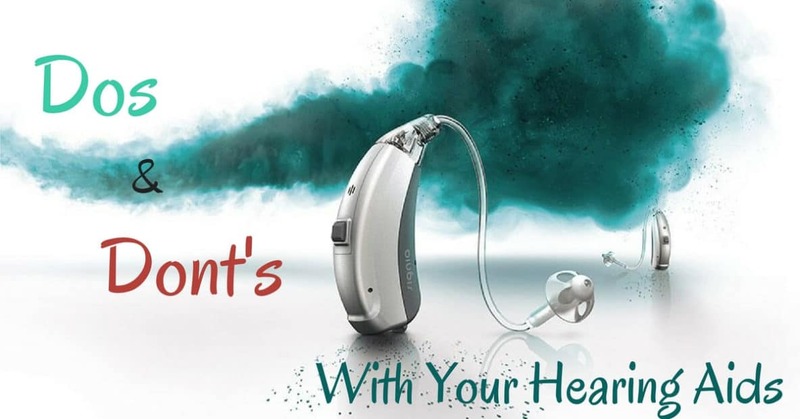 A quick check of your hearing aids every morning will not only help you to know when they need maintenance, it will also prevent you from being caught out in public or at work without a way to hear the sounds around you. 3) DON’T: Apply hairspray while wearing your hearing aids. This sticky beauty product can gum up hearing devices and wreak havoc on their internal components, and it is quite difficult to remove. With this in mind, always make sure to take out your hearing aids before applying hairspray, and make sure it is dry before putting your devices back in. This step may add a few minutes to your daily routine, but will help to protect your hearing devices and ensure they continue to function effectively. 4) DO: Conserve your batteries and change when necessary. To prevent your battery from running out quickly, always be sure to turn off your hearing aid at night. You can turn off your device by opening the battery door, but you may also wish to remove the battery when the aid is not in use. Opening the battery door also serves the purpose of keeping your hearing aid dry by allowing air into the device, which is important for preventing moisture build-up. Even with these conservation efforts, all batteries eventually need to be replaced. As a rule, smaller devices have smaller batteries which need to be changed more frequently. Most hearing devices will beep to signal that the battery is running low; change your battery as soon as you hear this signal. Also – be sure to keep a set of extra batteries on hand, just in case! 5) DON’T: Keep hearing aids where children can reach them. Children and babies love to put things in their mouths, especially things they aren’t supposed to have–as any parent will attest. A stray battery can be accidentally swallowed by a child in a second, and it is not always easily apparent that they have done so. This tiny yet dangerous item can burn a hole in the esophagus, sometimes causing irreparable damage — so keep your hearing aid batteries well out of reach of your children and grandchildren. If you suspect a child has swallowed a battery, go to the emergency room immediately. 6) DO: Give yourself time to get used to your hearing devices. Starting out slowly and gently is a good way to get used to wearing hearing aids. Your ears (and your brain) need time to adjust–so start with wearing devices for small intervals of 3 to 5 hours per day for the first couple of weeks. During this time, you may find adjustments need to be made, and don’t be afraid to contact your hearing specialists with any questions that arise. When you become comfortable with your hearing aids, increase wearing time by 1 to 2 hours every day. Soon you be able to wear them all day with ease! If you have any questions about the functionality of your hearing aids, or to schedule regular maintenance, contact us at HeaRite! Our friendly team is looking forward to answering all of your questions. Reach out to us any time.